Imogen's Typewriter. 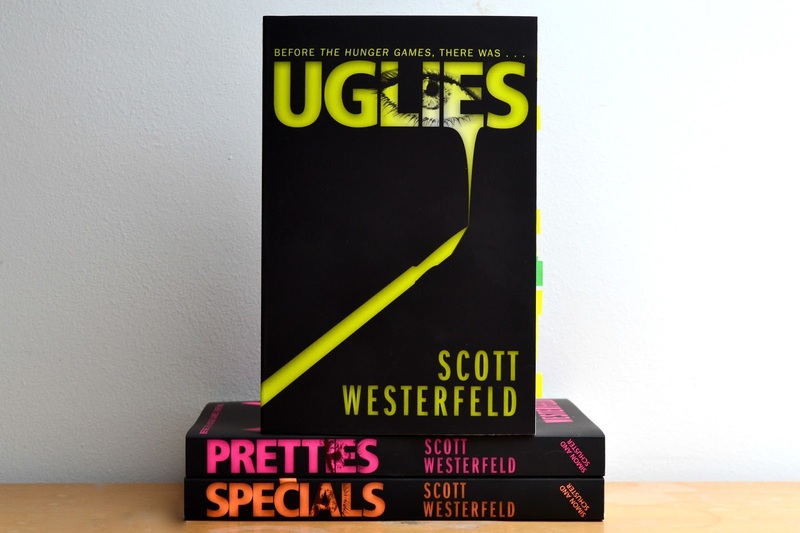 : Series Review: The Uglies Trilogy by Scott Westerfeld! Series Review: The Uglies Trilogy by Scott Westerfeld! I was going to say that I was late on the bandwagon to read this series but considering that Uglies was published in 2005, 10 years ago, I'm going to go with- So I completely missed the bandwagon when it comes to the Uglies/ Pretties/ Specials books but I have a couple friends who love them. In fact, when I hauled the books I got several texts telling me to read them immediately. My reviews in this post for the second and third book contain slight spoilers for the previous book, be warned. So here we go! This is a really strong start to the series, the world is set up easily and the story is fast-paced with our main character, Tally, denied the 'pretty' surgery until she goes and fetches her friend Shay from outside the city. There's a lot of dilemmas in this that are a more dramatic version of what happens to teenagers. It's a lot of high school drama but on a different scale which I loved, a lot of it is familiar as things most people go through at that age- friend loyalty, a relationship getting in the way, standing up to authority. I wasn't much of a fan of the writing, it wasn't bad by any means, but it didn't really impress me although I have to mention Scott Westerfelds great use of imagery. The sky is the colour of cat vomit and the squeaking of shoes is like a herd of panicked mice was amazing. Overall though, this book really impressed me, I can see why my friends loved it. Again, the writing was nothing special; more great imagery, and a few really poignant moments but pretty simplistic throughout. It reflects the intended audience. The story was as strong as the first but despite a similar plot line, it wasn't tired. A pretty strong second book, I can say with almost certainty that if you liked Uglies then you'll like Pretties. I marathoned right through these books quite happily. What I really admire about this series is that it shows most of the point of views of the world within one character. In Specials Tally is, you guessed it, a Special. The only point of view not covered is the older pretties and the little kids, so it shows the problem with this dystopian world, and all it's problems, from almost every side unlike others. The writing evolves on a little but not by much. And we finally get an answer for the love triangle, admittedly one that I hated but still. I want to talk about a couple of things here. I really didn't get the whole ego thing. Maybe that says something bad about me but it didn't seem like Tally had much of an ego as Shay kept saying, as much as bad things kept happening to her and she did the best she could in the situation she was in. Does anyone else feel this way or? Shay, oh my god. I loved her at the beginning of the first book because she challenged Tally's ideas about the whole pretty society and was the voice of reason- but it really went downhill from there to the point where she became the villain to me. Dr Cable and the society were the obvious villains but Shay was something worse- a really poisonous 'friend'. I do worry about a negative effect, there's really nothing in these books that says- hey, some people get plastic surgery and really, that's okay too. The whole pretty-head thing could be seriously skewed. Maybe the fourth book will clear up a few of these things for me. I'm really glad I read this trilogy though and it really made me think about the nature of beauty, plastic surgery, and what is important. In the words of my physiotherapist; 'Everyone is weird looking as a teen.' I wish I had read these when I was younger but even now at twenty-one, these books made an impact. The whole collection is £6.99 on The Book People here! Have you read the Uglies Trilogy? What did you think?